Sure enough, the next morning I was hungover as hell and a hangover-crushing meal was exactly what I needed. So I trudged the five blocks uphill to an area of town known as the Tenderknob. 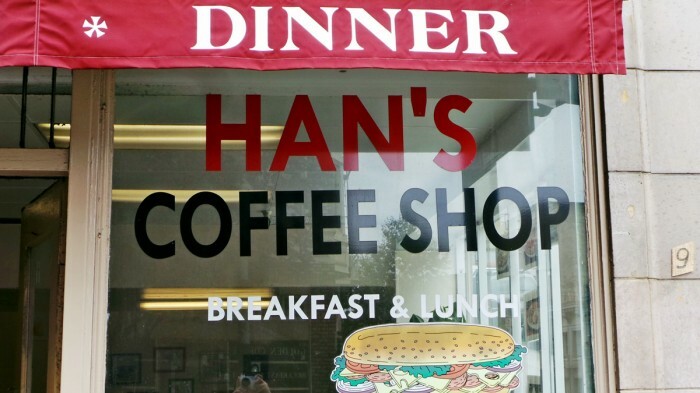 Han’s to the rescue. When you see this place, you’re first instinct is gonna be to run the hell away. It looks like a dump and yes, that is a homeless man leaning against the entrance, but throw caution to the wind and proceed inside. This place is super old school. 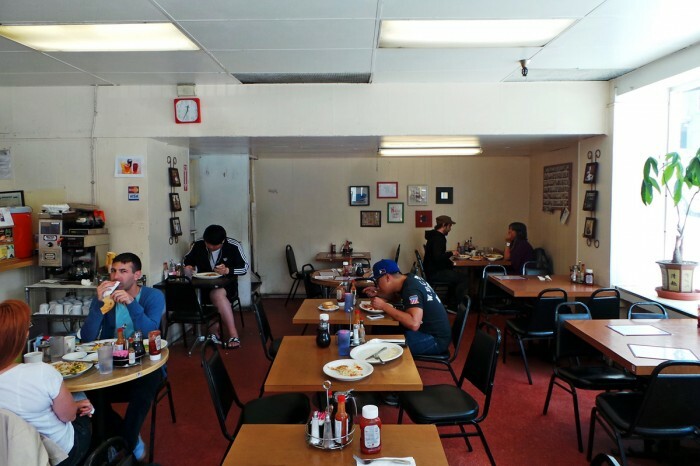 It’s the kind of place you’d go to for a cheap, filling, no frills plate of bacon and eggs. You’ll hear the sizzle of oil and the rhythmic clanging of spatulas on the flat top grill in the kitchen, a melody I find particular comforting. 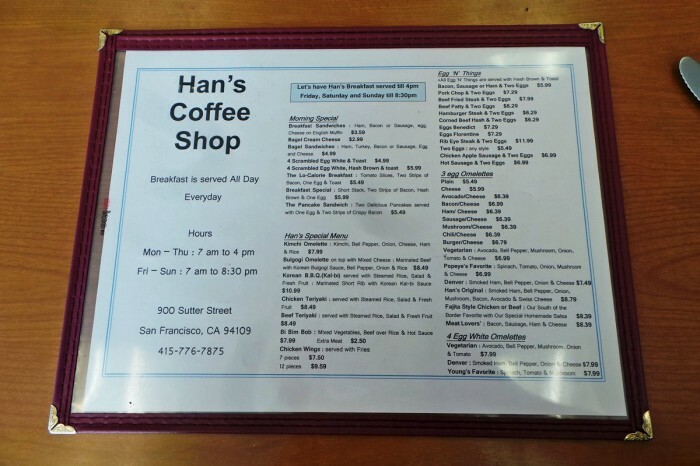 In fact, with regards to the prices and aesthetic Han’s reminds me a lot of the divey mom-and-pop waffle houses I frequent when I’m in north Texas. But there’s a twist here, this run-down slice of Americana is a owned and run by a Korean family. 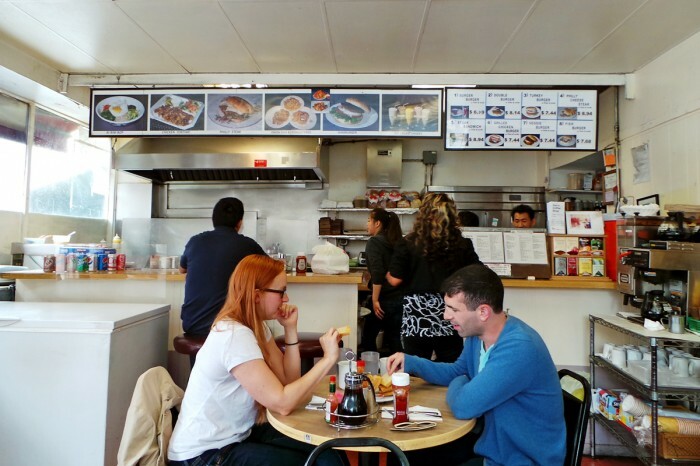 So in addition to the American greasy-spoon standards, they also offer a ton of Korean classics and Korean American crossover dishes on the menu which as you probably suspected is where I was drawn to. I couldn’t resist giving one of these fusion items a go so I ordered a Bulgogi Omelette in an attempt to crush this hangover. In no time flat a massive ceramic plate with an absolutely enormous stuffed four-egg omelette was presented to me. 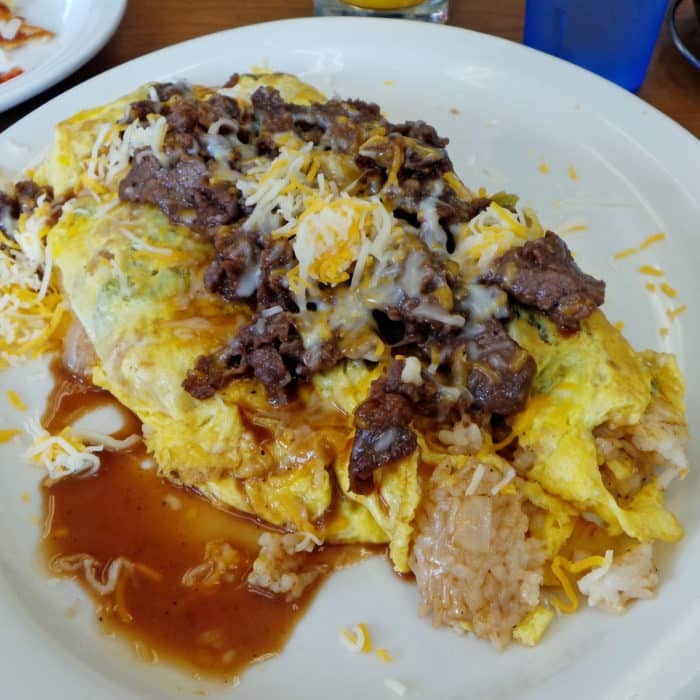 It really was excessively overstuffed with grilled onions, green peppers, white rice, melted jack cheese and was topped with thin, shredded bulgogi beef and drizzled with plenty of sweet brown bulgogi sauce. This thing was magnificent, truly a sight to behold and the fusion of American breakfast comforts with traditional Koreans flavors worked seamlessly. Not since my visit to Camellia Grill in New Orleans have I seen (and consumed) an omelette of this magnitude. This Korean American gut bomb is a phenomenal hangover breakfast. So despite what your instincts might tell you about a place that looks as beat up as this, ignore them and give Han’s a shot. Go especially if you are looking for a huge, cheap, flavorful, filling, meal to kill a hangover and you can thank me afterwards. 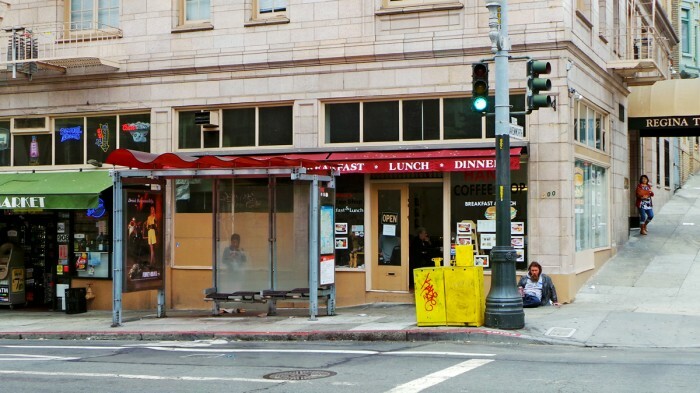 Got another divey breakfast joint in SF worth visiting? Let me know in the comments below.